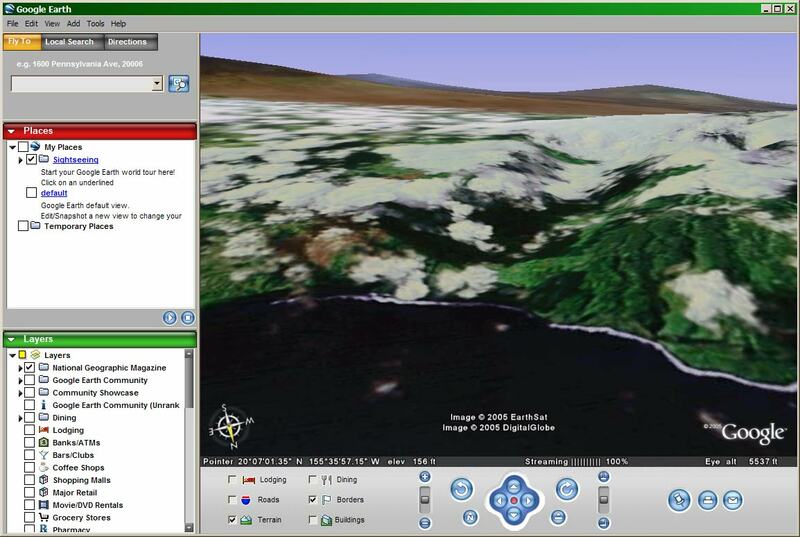 Google Earth ($400, or free for limited version) is a combination of a Windows viewer program and a subscription to a large, streaming online database of geospatial data. Although the viewer and the database are only available together, their quality can be considered separately. The free version is reviewed here. 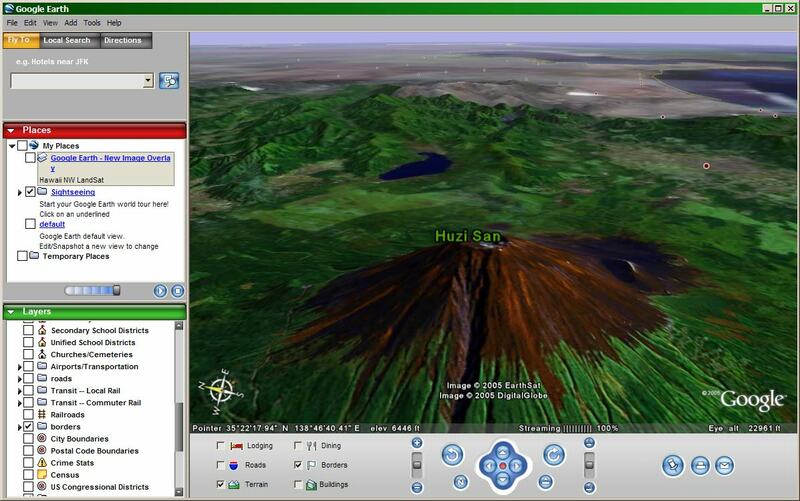 Google Earth (henceforth "GE") is an improved version of the 'Keyhole Earthviewer 3D' application which was the name of the product from 2002 to 2005 when Keyhole was bought by Google. I reviewed the Keyhole software in 2002, and it's great to see that both the software and online database have improved in many ways since that time, although other crippling limitations remain. The application consists of a single large window surrounded by panels for Navigation, Layers, Searching and so forth. Thankfully, the panels can be rearranged and hidden, and the awful "sculpted", non-rectangular frame of the Keyhole product is gone. Paging and streaming of the data was very smooth and responsive over my broadband connection. Cracks in the terrain elevation would sometimes appear during paging, but these were minor. Feature rendering was generally good, with some bugs in display of roads experienced in the USA. Road lines would sometimes vanish if you got too close. Texture seams, while present, were fairly minor. Overall, rendering performance was excellent. General navigation was silky smooth, and even with dense content such as all the 3D buildings in lower Manhattan displayed, GE maintained an interactive framerate of at least 8 fps on my system, which has only a modest ATI Radeon card. Streaming of content was also extremely fast and smooth, noticeably better than free earth viewers such as NASA World Wind. 3D navigation is always a difficult area, since there are no standard interfaces, as there are with 2D GUIs. In 3D, what is intuitive for one person can be entirely confusing and difficult to another. GE is no exception. I found the default means of panning and zooming to be very frustrating. The controls, which make sense when you are looking straight down, cease to make sense when you tilt the camera. At that point the controls labeled "up" and "down" actually move you forward and backward (!) and to actually move the camera up or down involves a series of back-and-forth "move, zoom, move, zoom" operations. After a few minutes i started to adapt to it, but by no means was it intuitive. "Turn" left and right does not turn the camera, but rather rotates it around some mysterious, unmarked point somewhere ahead of you. Similarly "Tilt" does not simply pitch the camera, it pivots it around that same point. After exploring the options, i found two other navigation modes. "Click and Zoom" produced mysterious, slow panning/zooming effects which seemed to bear little relation to what the mouse did. "G-Force" produced airplane-like motion perhaps more familiar to flight-sim users, finally a way to pitch the camera, but not without wild, disorienting camera roll and velocity. I could find no way to simply move the camera up or down (either camera-relative or earth-relative), which is quite a dramatic shortcoming for a 3D viewer. Worse yet, the mouse conventions for zooming are precisely opposite of every other 3D (and 2D) earth-viewing application that has come before: Rolling or spinning the mouse wheel forward moves the camera backward. Google has licensed some very large commercial datasets, of variable quality. The default low-resolution full-earth coverage was of reasonable quality, either 30m blurry LandSat with unbalanced color, or crisper 15m pan-merged LandSat. The color aerial insets for a large number of cities and populated regions around the world were beautiful - even stunning. 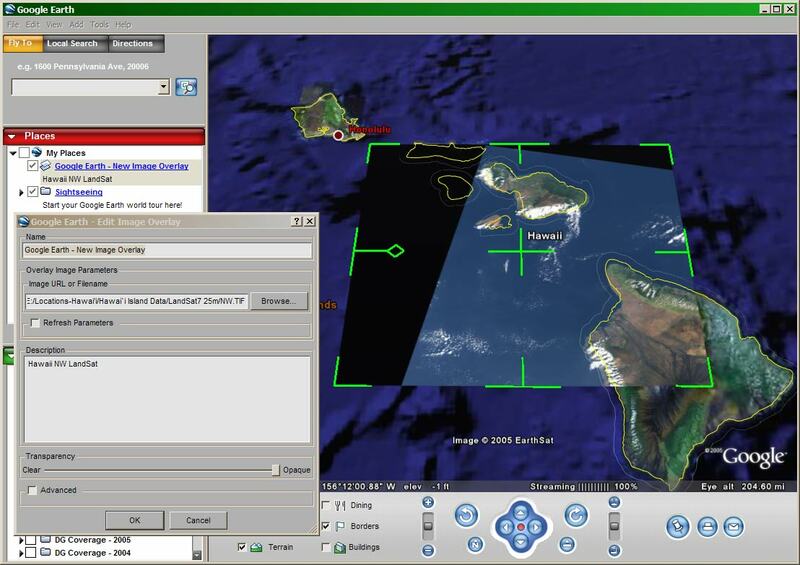 The licensing of this excellent aerial data, although burdened by onerous restrictions on usage, is definitely what sets GE apart from the free earth viewers. The U.S. imagery outside of major cities is quite variable in quality. While some areas are quite good, in others there are issues including wildly divergent color calibration, very blurry areas obviously far rougher than 15m, and some significant cloud coverage. An impressive inset was Afghanistan, although it was marred by enormous blue areas in the desert where there are no actual bodies of water. Since similar artifacts also appear in this part of the world in the Blue Marble imagery, i presume that this is a pitfall inherent in the source data such as AVHRR. Hawai'i: blurry LandSat, high cloud cover, and terrain reduced to nearly flat because of ~2km data. Also disturbing are the three copyright notices on screen, despite the fact that everything being shown is public domain data. The quality of the elevation is variable. Thankfully, Google has replaced the poor ~2km resolution of previous versions with ~100m SRTM globally. The USA has what appears to be 30m DEM in most places, with some glaring exceptions such as Hawai'i, which has the same awful ~2km resolution they had many years ago. This is really surprisingly bad, given that free USGS DEM is available at 10m - so GE is displaying something that's 40,000 time worse. Generally, the database of names for populated places and geographic features is fair at best. I encountered one problem with many town names that failed to appear as expected. Upon further investigation, in some cases this was due to a software flaw: the label does not appear until you are very close to the town. In other cases, it was a dataset flaw: the location for the town being quite wrong; for example, the label for Gerlach Nevada is displayed 3km away from the town. Internationally, there were a large number of cities such as Kabul Afghanistan which appear twice - two dots for the same city, in two different places! Searching on feature names was also poor; e.g. prominent features "Mount Everest" or "Timbuktu" returned no results. Nor did local spelling help; "Tombouctou" also fails. Even after manually navigating to Tombouctou, with the named dot appearing in the 3D view, searching for that name still failed - it couldn't find what it was already displaying! Other names were just plain wrong, even for major features, such as Mount Fuji, which is labeled "Huzi San". The detail and accuracy is really shabby, no comparison to a consumer atlas program such as Microsoft Encarta. This is a shame, as GE could serve as a great atlas if it had a better name database. Culture is limited to 3D buildings, which are are provided for a list of US cities. These are just plain grey extruded footprints, with not even major landmarks given a specific model. For example, the Transamerica Building in San Francisco looks likes a strange, skinny Chevrolet logo. There are no other structures or vegetation at all. GE is predominantly a viewer of canned content: there are few ways to import or visualize your own data. You can import imagery using the command Add: Image Overlay, but this feature appears to be geographically challenged - it does not know anything about coordinate systems or georeferencing! Placing the image on the earth is a matter of hand-manipulated guesswork. Even when importing a GeoTIFF, GE pays no attention to the georeferencing in the file. This seems like an astonishing shortcoming in an application with otherwise sophisticated image handling. I found no way to import GIS data, additional roads or buildings, or elevation data. According to the GE documentation, importing GIS data (point/line/polygon) is available as a feature of the paid version, a $200 added module on the base $400 product. There is also apparently a limited way to import point data in the free version, via their KML file format. As a fast, smooth viewer of global imagery, the free version of GE can be a lot of fun - if you can adapt yourself to its awkward navigation. It isn't a general purpose tool for visualization of geospatial data, nor is an effective atlas, nor any kind of GIS. Educational potential is limited by the inability to click to get information about what's in the view. With a better feature database, better searching and some basic interface improvement, GE could develop into a useful application.